FSMIS (February 28, 2013): President Manny Mori approved Congressional Act number 17-81 to become FSM Public Law number 17-74 on February 12 with concerns raised on a number of decisions made by Congress. In anticipation of the last January session of Congress, President Mori submitted a budget supplemental request of $9,442,096 – an unallocated amount from anticipated revenue for the current 2013 fiscal year. However, Congress appropriated an amount of $2,297,000 for specific purposes, leaving a balance of $7,145,096 unappropriated. The table below details the funding allocation per budget item. In his signing letter to Speaker Isaac V. Figir, President Mori raised concerns that certain appropriated items were passed without consultations with the President’s Office and any public hearing undertaken. These items included increases for representation funds by $10,000 each for the President and the Members of Congress. “I truly believe that we could have waited until after we have had the opportunity to consult on the matter preferably in April or May”, the President indicated. A number of other items submitted in the supplemental request were not included in the Act, such as the FSM Trust Fund, Department of Justice personnel budget, funding for the new patrol boat – FSS Unity, Unified Revenue Administration Automation Project, FSM National Government Pension Plan, AIP matching, and Airport Project. In view of the eventual termination of Compact funds in 2023, the President proposed that audited unexpended operation budgets (carryover) be invested in the FSM Trust Fund Account beginning at the end of FY13 onward. Furthermore, President Mori sought for Congress’ cooperation in transferring the unappropriated “over $6 Million” in current year expected revenues into the FSM Trust Fund Account. He said, “I note that certain members (of Congress) have expressed the desire that this money (unappropriated revenues) be distributed to the States to help their needs. While I applaud and agree that we must help the states in their critical needs, however, let us help them to make sure that we have and share the underlying plans and objectives to use the funds in manner that will address their specific priority needs. The best way to respond to their re-occurring needs is to reconsider the revenue sharing of 50% - 50% by increasing the Stat’s shares by 10% and reduce the National Government’s share by the same rate”. With the signing of the Act into law, the total FY13 operation budget for the National Government is $44,786,854, which includes an amount of $9,309,777 for various capital improvements, development programs and human resources development activities under section 9 of P.L. No. 17-64, as amended, labeled as Capital and Human Resources Development. For more information, write fsmpio@mail.fm or call 320-2548. FSM Department of Resources & Development, States eye strategy for biofuel production throughout Federation. This is a special news release from Fuel Lines, a newsletter from the FSM Petroleum Corporation (PetroCorp), a.k.a. Vital. POHNPEI, FSM - A broad range of over 60 people from government, private sector, traditional leadership and civil society gathered last Saturday in Kolonia, Pohnpei to set forth on a strategic plan of action to rehabilitate the coconut sector in the Federation. The Coconut Sector Strategy Design Team workshop was organized by the FSM Department of Resources and Development, with support from the FSM Coconut Development Authority (CDA), the FSM Office of Environment and Emergency Management (OEEM), the Secretariat of the Pacific Community (SPC) and Vital Energy. During the workshop state and municipal representatives from Kosrae, Yap, Chuuk and Pohnpei were introduced to the internationally proven Focused Results Delivery (FRD) process for sector design. FRD is a structured, time-bound and comprehensive process promoted world-wide by the International Trade Center (ITC), a subsidiary of both the World Trade Organization and the United Nations. A strategy for the coconut sector is a means for the national and state governments of the nation to achieve meaningful outcomes under both the National Energy and Agriculture Policies already in place in the FSM. The end strategic document expected to be developed over the next 150-180 days will be market-led, private sector-driven and government supported. Energy and Agriculture, along with Tourism and Fisheries, are the identified long-term linchpins of the FSM economy. These four sectors are also expected to develop coherent strategies for development and domestic growth beyond 2023, a prerogative of the Mori Administration. In late April or early May, the FSM will be hosting its 1st National Investment Symposium around the four linchpin sectors of the economy. With a draft strategy in place that identifies the key gaps in the sector, the nation will offer focused investment opportunities for development partners into the coconut industry. At the one-day workshop, presentations were delivered by R&D Deputy Secretary Alissa Takesy, CDA GM Namio Nanpei, OEEM Director Andrew Yatilman, Vital CEO Jared Morris and Vital CFO Mathias Lawrence. In his presentation, Morris linked the broader long-term concerns of FSM PetroCorp - parent company of Vital - to the concerns of people and their families. He noted that in the long view, Vital would need to diversify according to the goals set forth in the National Energy Policy, which is heavily weighted toward higher efficiency and renewable, locally-sourced forms of energy. Ultimately, he said, the nation simply cannot afford to continue spending over $50 million annually for fossil fuel. Takesy, Nanpei and Yatilman expounded variously on the critical need for a multi-stakeholder process, the essentiality of public policy support and that there must be private sector - business and civil society - involvement in order to achieve and maintain social and economic sustainability over time. One of the primary outcomes of the workshop was the designation of a Core Team, subject to review and approval by the political heads of each FSM State. The Core Team will be visiting each of the states over the next several months to hold ensuing workshops with government, private sector, traditional leaders, NGOs and farmers associations to gain the necessary input and support to the coconut sector strategy. “This is the first time in 30 years that we have held a meeting such as this, bringing together so many people focusing only on coconut”, Rosa Namio Nanpei -- GM, FSM Coconut Development Authority. The actual number of employees currently on board will be lower than the number of positions as some jobs have yet to be filled or are still being announced, such as those shown on the FSMPIO website in the job announcement section. For further information, write to fsmpio@mail.fm or call 320-2548. Kolonia, Pohnpei: More than 60 key States and National Government representatives and NGOs from throughout the Federated States of Micronesia (FSM) gathered in Pohnpei, FSM to formulate a project concept paper to access more than $4 million available to FSM from the Global Environment Facility (GEF) for improving the FSM environment. The project concept design workshop was held from 11th - 13th February, 2013 and was able to identify key priorities as the need to strengthen the nation’s protected areas in all 4 States, as well as to conserve and restore critical ecosystems throughout the Federation in an integrated manner. “This workshop is an early part of a long process but we are fortunate at this stage to have reaffirmed our nation’s collective aim to not only build on work already ongoing in the four States to maintain our intact areas, but also to integrate these efforts with actions to address environmentally important areas that are being threatened by our environmentally destructive actions”, noted Mr. Andrew Yatilman, Director of the FSM Office of Environment and Emergency Management (OEEM). The consultation was part of the response to the request from the FSM for a proposal under phase 5 of the GEF Systematic Transparent Allocation of Resources (STAR) and the country’s participation with the proposed Ridge-to-Reef (R2R) multi-country program for the Pacific. FSM’s involvement in the “Pacific Islands Ridge-to-Reef (R2R) program” will facilitate further sharing and learning amongst the Pacific nations on effective environmental management. This Pacific-wide program will also support actions on integrated water, land, forest & coastal management to preserve ecosystem services, store carbon, improve climate resilience and sustain livelihood. The workshop was jointly facilitated by the FSM Office of Environment and Emergency Management and the United Nations Development Programme (UNDP). For further information, please contact OEEM at 320-8815 or write to Mrs. Cindy Ehmes at climate@mail.fm. Yap Health Services and indeed all health services in the FSM are proud of the efforts of Dyanna Keiji, a senior from Yap High School. She won the regional Laboratory Open Day Speech Competition held in Hawaii on February 8, 2013, which was sponsored by the Pacific Island Health Officers Association and the Association of Public Health Laboratories. Open Day events took place in each FSM hospital laboratory last year. Competitions were held to select state winners in speech and poster presentation categories. State winners were then brought to Pohnpei to compete for the honor to represent FSM in the regional competition. The FSM winners were sponsored to travel to Hawaii, along with counterparts from other US Affiliated Pacific Islands. Other jurisdictions represented included finalists from Palau, Marshall Islands, Guam and CNMI. Nelsin Mack, a junior from Madolenihmw High School represented FSM in the poster category, and Dynna, a senior from Yap High School, represented FSM in the speech category. While Nelsin Mack submitted an impressive poster, Janette Loeak from Ebeye SDA School in the Republic of the Marshall Islands won the poster competition. The judging panel for the speeches included: Dr. Ursula Bauer, Director of the CDC Chronic Diseases and Prevention Unit; Dr. Chris Whelan, the Director of the Hawaii Public Health laboratories, LCDR; Dr. Tai Chen HO, CDC’s Department of Quarantine and Immigration; Dr. Ian Rousse, the Dean of the School of Medicine, FNU and Alicia Sitain from PIHOA. Dynna spoke clearly and confidently as she told a story of a young woman who was grateful to her Drs and Nurses for saving her life after life threatening bleeding after giving birth to her son. Dyanna explained that although the Doctors and Nurses did indeed play a very important role in saving the patient’s life; the behind the scenes work in the laboratory, in performing the blood tests to help with the diagnosis, in testing the donated blood for infectious diseases and in making sure the donated blood was compatible with the patient is often not appreciated. She explained the importance of the many unseen actors in health care who support our doctors and nurses. FSMIS (February 19, 2013): Officials from the United States Department of the Interior, Office of Insular Affairs (OIA), Mr. William Galo, a US JEMCO member, and staff from other US agencies are in Pohnpei State and will be here for the next few days. Likewise, certain cabinet members and department staff from all the States and the National Government of the Federated States of Micronesia (FSM) have made themselves available in Pohnpei for the purposes of the annual budget consultations with US officials with regards Compact related financial assistance in fiscal year 2014. The consultation process will take place the next few days until February 21, Thursday, to allow for particular reviews of priority sector grants for all the governments in considerations of established JEMCO requirements and on-going fiscal adjustments made within the FSM such as the Long Term Fiscal Framework undertaken the last several months. From the FSM side, a comprehensive press release on the consultation process and its outcomes will be made by the Office of SBOC, the focal point for Compact related matters for public view toward the end of the week. For information, fsmpio@mail.fm or call 320-2548.
of Justice, Mrs. April Dawn M. Skilling. FSMIS (February 18, 2013): President Manny Mori shared the morning of February 14 with visitors from the Executive Leadership Development Program. According to its website, the Executive Leadership Development Program (ELDP) “is managed by the Graduate School USA's Pacific Islands Training Initiative, with funding assistance from the United States Department of the Interior's Office of Insular Affairs. Program participants from throughout the US-affiliated insular areas meet for four, one-week periods over the course of a calendar year”. This year’s participants from the FSM National Government include Mrs. Suzanne Low Gallen from Office of SBOC, Mr. Carson Mongkeya from Department of Foreign Affairs and Mrs. Lynn Narruhn from Congress Office. The first ELDP session was held during the week of September 23, 2012 on Guam. 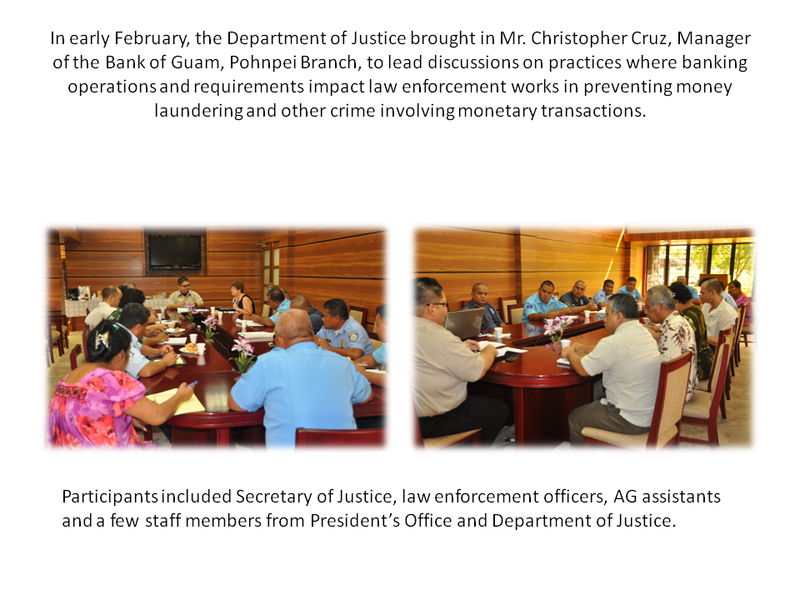 The second session took place in CNMI starting on November 5. Pohnpei (FSM) hosted the third session during the week of February 11, 2013. The fourth and final session will take the participants to Honolulu the week of June 10, where they will conclude their study and graduate from the program. FSMIS (February 15, 2013): President Manny Mori held a cabinet meeting earlier today to discuss the draft Peer Review Report with the heads of departments and offices. In November 2012, a team of Pacific-based experts, facilitated by the Pacific Islands Forum Secretariat (PIFS), undertook an independent review of FSM’s processes for formulating development plans, budgets, public financing, aid coordination with development partners and the monitoring and reporting of results. In addition, the team was asked to evaluate the policy environment in terms of its suitability in promoting private sector development. The review was done at FSM’s request. At the cabinet meeting today, President Mori and other officials shared views on a number of observations and recommendation that were raised by the Peer Review Team as generally discussed in the draft report under categories of planning; Budgeting and performance management; Public Financial Management; Private Sector Development; and Aid Management. The Office of SBOC (Statistics, Budget and Economic Management, Overseas Development Assistance and Compact Management) has been tasked to compile the views on the Peer Review report and share with the team before the final report is produced. After the final report, the FSM will consider the recommendations for possible implementations. The Peer Review Team also recommended that a follow up review be undertaken six months after the final report to assist FSM and PIFS in sustaining the purpose and benefit of the review. A substantial coverage on the Peer Review report will take place after final draft is produced by the team. For details, fsmpio@mail.fm or call 320-2548. FSMIS (February 14, 2013): After months under construction, the National Emergency Operation Center was formally dedicated on February 13 with through a ceremony that brought in officials from the National Government, the Secretariat of the Pacific Community (SPC), the International Organization for Migration, visitors from the state governments who were in Pohnpei for various purposes and other supporters. Mr. Mosese Sikuvou, Deputy Director, Disaster Reduction Program at SPC said that the FSM was one of four Pacific countries that opted to use a specific European Union (EU) funding for construction of Emergency Operation Center and procurement of equipments for the center’s operation. “Over the last 12 months, SPC completed construction of emergency operation centers at all the four states, and we are hoping, working with you, that as soon as practicable, if not already done, this will be occupied and become fully operational”, Mr. Sikuvou said. He also said that SPC has been working with the FSM, with support from EU, to strengthen institutional capacity building for disaster risk management. Mr. Sikuvou spoke of activities in the pipeline that would ensure investments such as the EOC are sustained not only through new initiatives but also through strengthening existing risk management schemes that have been in place the past several years to ensure better coordination. These activities include training at the end of the month for the actual management of the center. Speaking on behalf of President Manny Mori, Secretary of Foreign Affairs Lorin S. Robert welcomed everyone and thanked SPC and EU for enabling the renovations and construction of such centers. “With the completion of this one in Palikir, we are grateful there is now better and improved coordination of all aspects of disaster management”, Secretary Robert said. The Secretary also congratulated Director Andrew Yatilman and his Office of Environment and Emergency Management (OEEM) staff for the new office building into which they will soon be relocated. “Now we can feel safer going to sleep knowing someone is watching over us”, was Mr. Robert’s last line which prompted jolly approval from his audience. Constructed by the APSCO in Pohnpei, the new sturdy building will be the location for OEEM which is the focal entity for environment and disaster related issue. For further information, contact OEEM at 320-8814/8815. The Chief of Mission for the International Organization for Migration (IOM) for the FSM and the Marshall Islands, Mr. Ashley Carl met with President Manny Mori on February 7 and reported on a number of activities that the organization has undertaken since the FSM became a member state in December, 2011. Mr. Carl spoke about the opening of IOM’s office in Chuuk State as an enhancement of its ability to implement activities throughout the FSM with its headquarters in Pohnpei and another field office in Yap. He also shared about the ongoing climate change and DRR education activities at some schools throughout the FSM being implemented by IOM with funding from AusAID. He said the program has been “welcomed by Micronesian teachers and students”. Visual products of this program are readily displayed at public places and also shared with schools and communities throughout the nation. Mr. Carl highlighted IOM’s strong collaboration with the FSM Office of Environment and Emergency Management on the USAID disaster preparedness awareness program which has been ongoing for some time. A newest edition to IOM’s undertaking in the FSM is the opening of the Migrant Resource Center (MRC) in Pohnpei. The MRC’s main service will be the provision of cultural orientation for Micronesians relocating to the United States and awareness raising on human trafficking. President Mori welcomed Mr. Carl and exchanged views on IOM’s activities, directing attention to the National Government’s taskforce on migration. He emphasized the need to collaborate on proper orientation to ensure the objectives of the MRC and the taskforce are aligned and adequately assist Micronesians going abroad. The President expressed appreciation for the opportunity to hear directly from Mr. Carl on the activities that would assist FSM to strengthen disaster preparedness abilities in the communities and indicated his welcome for similar briefings in the future. FSMIS (February 14, 2013): On February 13, President Manny Mori sent greetings and congratulations to Secretary John Kerry, United States Department of State as he assumed the eminent role within President Barrack Obama’s Cabinet for the next four years. President Mori said, “we are a proud partner of the United States under the Compact of Free Association, and as you assume the daunting challenges of leadership over the next four years, you can be assured of our continuing support for freedom and democracy”. “Our two government’s collaboration, through the Compact of Free Association, remains the key to the ongoing efforts to move the FSM closer toward economic development and budgetary self-reliance by the end of the Compact grants assistance in fiscal year 2023”, the President further stated. The President also took the opportunity to express his appreciation for a US climate-related initiative that complimented FSM’s initiative under the Montreal Protocol as a nation whose sustainability is intricately linked with proper stewardship of the environment. “With this US initiative, I look forward to discussing how we can continue to work together given that the FSM has a similar initiative under the Montreal Protocol addressing the same issue of short-lived climate pollutants”, President Mori indicated before reiterating FSM’s gratitude and support. FSMIS (February 14, 2013): In response to FSM Chief Justice Martin G. Yinug’s invitation, President Manny Mori named Secretary April Dawn M. Skilling on February 12 as the Executive Branch representative on the FSM National Law Day 2013 Coordinating Committee. A coordinating committee is appointed each year by the Chief Justice with representatives from the other branches to organize the law day. The committee selects its chairman and decides on the topic of the debate. Since 1991, the FSM Law Day debate has become the premiere annual debate in the country with over $150,000 in scholarship funds issued to the high school student participants to pursue college degrees. After rounds of debates at the state level, finalists square off with debaters from other states on July 12 in a one-day event that is nationally broadcast. This year’s debate topic will be formulated pending the convening of the coordinating committee. For more information, fsmpio@mail.fm or call 320-2548. FSMIS (February 13, 2013): On February 8, 2013, the President of Taiyo Micronesia Corporation (TMC), Mr. Toshio Abe, made a courtesy call on President Manny Mori in Palikir. Joining President Mori at the meeting was the Secretary of Foreign Affairs, Lorin Robert. After just one year since his first meeting with President Mori, Mr. Abe returned and shared with the President the good news that during the seven months of operation of the Taiyo Micronesia Corporation (TMC), a joint venture between Taiyo A&F Co., Ltd. Japan and the FSM National Fisheries Corporation, the TMC Board of Directors declared a $1million dividend to be divided among its share holders. One of the conditions of the joint venture arrangement is that the TMC will underwrite a feasibility study for a possible shore-side processing plant for Katsuobushi (dried bonito) in the FSM. Another competitive and more profitable component of the joint venture is for TMC to introduce modern and best equipped fishing vessel into FSM. Arrangements for this component are being discussed with local fishing authorities. Accompanying President Abe were H.E. Eichii Suzuki, Japan’s Ambassador to the FSM, Mr. Peter Sitan, President/CEO of NFC and other staff members of the Japan Embassy and the corporation. President Mori welcomed and congratulated Mr. Abe for the good news and encouraged Taiyo to expand its operation in the FSM. He assured Mr. Abe that the FSM Government will continue to support the TMC business activities in FSM. Noting job opportunities and the intension of shore-side investments, President Mori expressed the need for TCM to bring to shore its by-catch to be processed as animal feeds for pigs, chicken and possibly mangrove grabs. President Mori urged the local partner to speed up the process of establishing a new fishing corporation that will better serve as a fishing joint venture partner with foreign investors such as Taiyo of Japan. NFC CEO, Mr. Peter Sitan stated that a significant step had taken place in promoting a model of cooperative arrangement between Japan and the FSM. He called the quick TMC success a “demonstration of strong positive result” facilitated through cooperation between industry and government policy makers and a core of dedicated employees. He further commented on the industry’s need for government support and how TMC showcased success when government-industry collaboration is in place. The TMC experience is in line with President Mori’s policy of encouraging foreign investment, which is spearheaded by the Department of Resources and Development in collaboration with relevant departments, offices, agencies and state counterparts. The President’s focus on attracting foreign investment in the tuna fisheries sector is complemented by sub-regional initiatives, which has enalbed TMC to fish in the Exclusive Economic Zones (EEZ) of the eight PNA (Parties to the Nauru Agreement) member countries under one fishing permit. This support allows preferential treatment to certain vessels hosted by PNA member countries which meet established eligibility criteria. According to Mr. Sitan, this is the first time a dividend has been declared for a fishing company in FSM within his 30-plus years experience in fishing operation in the country. For more information, contact the NFC Office at 320-2529. FSMIS (February 13, 2013): On February 1, after a series of consultative meetings with Yap State leaderships, traditional leaders, the private sector and NGO’s regarding the Chinese ETG investment proposal, President Manny Mori shared with Governor Sebastian Anefal and the Yap State Legislature a document on what transpired at those meetings with recommendations. ETG stands for Exhibit and Travel Group, a Chinese business with overseas investments and operations. President Mori indicated to both Governor Anefal and the Yap State Legislature that moving forward with the scaled-back ETG investment would be in the best interest of Yap State and the Federated States of Micronesia (FSM). However, he stressed that the decision to allow ETG to proceed rests with Yap State. The President decided to take on the consultative meetings in mid-January in hope that conclusive leadership decisions can be achieved soon enough. He said in his meeting report, “because of the current impasse and the lack of a clear understanding of the role that the national government has in terms of foreign direct investments, I though it is incumbent on me, as President, to address the issues directly with the concerned parties and see how I can bring their divergent views together towards a more accommodating and acceptable alternative”. In the same report, President Mori stated that the initial ETG investment interest in Yap was to include the construction of 10,000 room hotel facilities, golf courses, casinos, a convention center and other “entertainment support facilities”. “I must say that I also have concern about the initial scale of the project”, the President highlighted before saying that the investment plan has been dramatically reduced so that no golf course and casino will be included and that only 1,500 hotel rooms will be constructed. He went on to say that further demands for scaling back and restrictions on the investment may not be financially viable for ETG, risking cancellation of interest altogether by the Chinese investors. In terms of economic benefits, the President envisioned increase in tax revenue from various ETG-related infrastructure constructions and creation of new services and jobs. It is anticipated that tax revenues to Yap State resulting from the ETG investments will be even greater if the proposed Value Added Tax scheme is implemented. President Mori spoke of the lack of information and the unanswered worries by the general public as complicating situations. He encouraged the leadership and ETG to engage the people as far as providing details and transparent information to cast away misunderstanding and create openness. He also spoke against providing wrong information as doing so will only provoke ill feeling toward investment and development in general. Other issues that were commented on by the President in his meeting report touched upon some impacts and their possible remedies in areas having to do with land issues, environmental protection and cultural way of life. “This ETG tourism investment proposal may be one of the answers to our desire to bring about meaningful development to our islands. We may not see another opportunity like this ETG proposal in our lifetime especially if there are no legitimate reasons to reject the investment proposal at the scaled-back level”, President Mori wrote at the end of his meeting report.